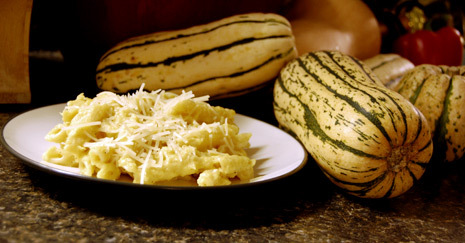 There has been an abundance of Delicata squash at our house lately, and I was ready to try something new with this wonderful winter vegetable. I searched high and low for a recipe that was a unique main entree and hit the jackpot with this recipe for Inside-Out Squash Ravioli Pasta on the Big Girls, Small Kitchen web site. The result was a delicious and filling “comfort food” meal that we will be sure to make again. Next time, we will probably add a little less nutmeg, to better suit our personal tastes. I have re-posted the recipe here below with the permission of Big Girls, Small Kitchen. Make sure to check out their site for more great recipes! In a medium frying pan, melt the butter over very low heat. Add the garlic and cook, stirring occasionally, until the garlic is golden, about 8 minutes. (Don’t raise the heat and try to rush this.) Add the cayenne, nutmeg, and salt. Now, add the milk, cream, and mashed squash to the pan, stirring to smooth. Raise the heat slightly, bring to the simmer. Simmer over medium heat until reduced, about 7 minutes. When you reach this point, you can add your pasta to the boiling water, so it’ll be ready at the same time as the sauce.